Old Macdonald’s Farms will set up a shady Marquee in your garden for those hot summer days and bring a variety of farm animals, of all sizes for everyone to interact with. Alternatively, should the Nursing Home require a smaller interactive indoor display of baby animals, including chicks, lambs, kids and guinea pigs, then Old Macdonald’s are able to provide a nursery presentation. Our baby animals can be nursed, hand fed, bottle fed, groomed or taken around to bedridden residents. We don’t like anyone to miss out! 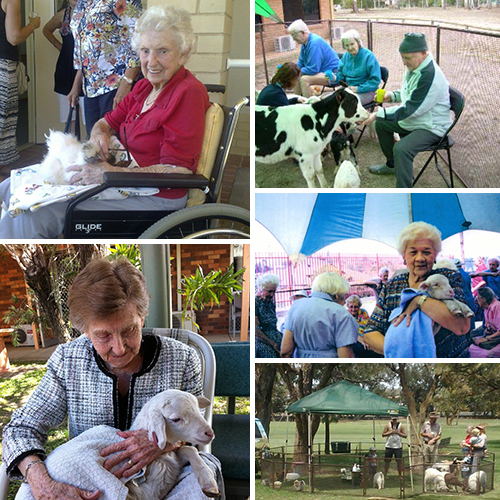 Quite unstructured and relaxing, a farm visit is sure to please Nursing Home residents as they relive happy childhood memories. 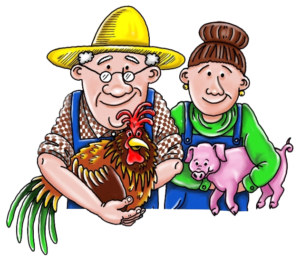 An ‘Old Macdonald Farms’ visit encourages lots of conversation well after the babies have returned back to the farm, memories of childhood pets or growing up with animals in their backyards or maybe as a child they visited a farm, will be recalled for many weeks! Don’t forget school holidays are a lovely time for families to enjoy the farm together. Our covered enclosure allows both children and residents to interact with the animals in a controlled and safe environment for everyone. Make sure everyone stays for the bottle feeding! Give the joy of touching and holding a baby animal to those, who may have ‘special needs’. Over the years Old Macdonald’s Farms have experienced the impact that our babies have on this special group, whether adults or children.